This unique line of jewelry based upon the graphic designs of Dard Hunter is hand-made by our good friend, Todd Hawkinson of St. Paul, Minnesota. Todd has a passion for both jewelry making and influential Arts & Crafts Era designs - and he combines these two passions to create fine jewelry using many of the same methods and tools as those in use 150 years ago! 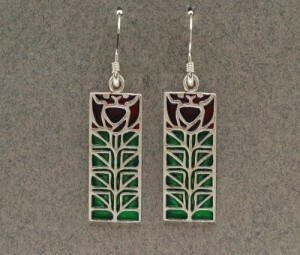 Handcrafted in solid Sterling Silver with enamel, and always made in the USA. Earring measures 1/2" wide x 1 1/4" high. Pendant measures 1/2" wide x 3/4" high (chain not included). This unique line of jewelry based upon the graphic designs of Dard Hunter is hand-made by our good friend, Todd Hawkinson of St. Paul, Minnesota. Todd has a passion for both jewelry making and influential Arts & Crafts Era designs - and he combines these two passions to create fine jewelry using many of the same methods and tools as those in use 150 years ago! 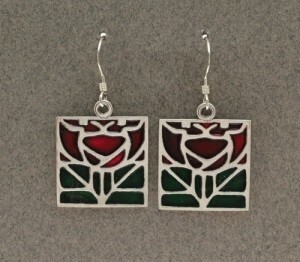 Handcrafted in solid Sterling Silver with enamel, and always made in the USA. Earring measures 1/2" wide x 1 1/8" high. Pendant measures 1/2" wide x 3/4" high (chain not included). This unique line of jewelry based upon the graphic designs of Dard Hunter is hand-made by our good friend, Todd Hawkinson of St. Paul, Minnesota. Todd has a passion for both jewelry making and influential Arts & Crafts Era designs - and he combines these two passions to create fine jewelry using many of the same methods and tools as those in use 150 years ago! Handcrafted in solid Sterling Silver and always made in the USA. Earring measures 7/16" wide x 1" high. Pendant measures 7/16" wide x 3/4" high (chain not included). This unique line of jewelry based upon the graphic designs of Dard Hunter is hand-made by our good friend, Todd Hawkinson of St. Paul, Minnesota. Todd has a passion for both jewelry making and influential Arts & Crafts Era designs - and he combines these two passions to create fine jewelry using many of the same methods and tools as those in use 150 years ago! Handcrafted in solid Sterling Silver and always made in the USA. Earring measures 3/8" wide x 1 1/2" high. Pendant measures 3/8" wide x 1" high (chain not included). This unique line of jewelry based upon the graphic designs of Dard Hunter is hand-made by our good friend, Todd Hawkinson of St. Paul, Minnesota. Todd has a passion for both jewelry making and influential Arts & Crafts Era designs - and he combines these two passions to create fine jewelry using many of the same methods and tools as those in use 150 years ago! Handcrafted in solid Sterling Silver and always made in the USA. Earring measures 1/2" wide x 1 1/8" high. Pendant measures 1/2" wide x 3/4" high (chain not included). This unique line of jewelry based upon the graphic designs of Dard Hunter is hand-made by our good friend, Todd Hawkinson of St. Paul, Minnesota. Todd has a passion for both jewelry making and influential Arts & Crafts Era designs - and he combines these two passions to create fine jewelry using many of the same methods and tools as those in use 150 years ago! Handcrafted in solid Sterling Silver with enamel, and always made in the USA. Earring measures 1/4" wide x 1 1/4" high. Pendant measures 1/4" wide x 1" high (chain not included). This unique line of jewelry based upon the graphic designs of Dard Hunter is hand-made by our good friend, Todd Hawkinson of St. Paul, Minnesota. Todd has a passion for both jewelry making and influential Arts & Crafts Era designs - and he combines these two passions to create fine jewelry using many of the same methods and tools as those in use 150 years ago! Handcrafted in solid Sterling Silver with enamel, and always made in the USA. 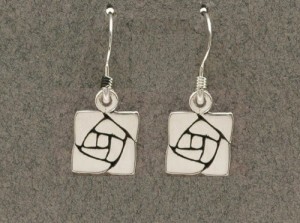 Earring measures 3/8" wide x 1 3/4" high. Pendant measures 3/8" wide x 1 1/8" high (chain not included). This unique line of jewelry based upon the graphic designs of Dard Hunter is hand-made by our good friend, Todd Hawkinson of St. Paul, Minnesota. Todd has a passion for both jewelry making and influential Arts & Crafts Era designs - and he combines these two passions to create fine jewelry using many of the same methods and tools as those in use 150 years ago! Handcrafted in solid Sterling Silver with enamel, and always made in the USA. Earring measures 7/16" wide x 1" high. Pendant measures 7/16" wide x 5/8" high (chain not included). This unique line of jewelry based upon the graphic designs of Dard Hunter is hand-made by our good friend, Todd Hawkinson of St. Paul, Minnesota. Todd has a passion for both jewelry making and influential Arts & Crafts Era designs - and he combines these two passions to create fine jewelry using many of the same methods and tools as those in use 150 years ago! 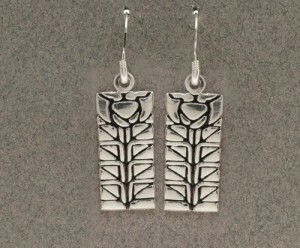 Handcrafted in solid Sterling Silver and always made in the USA. Earring measures 3/8" wide x 1" high. 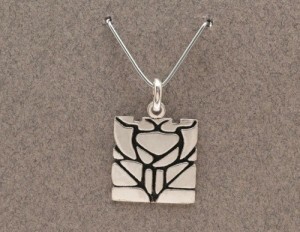 Pendant measures 3/8" wide x 5/8" high (chain not included). This unique line of jewelry based upon the graphic designs of Dard Hunter is hand-made by our good friend, Todd Hawkinson of St. Paul, Minnesota. Todd has a passion for both jewelry making and influential Arts & Crafts Era designs - and he combines these two passions to create fine jewelry using many of the same methods and tools as those in use 150 years ago! Handcrafted in solid Sterling Silver and always made in the USA. 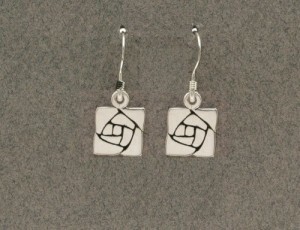 Earring measures 7/16" wide x 1 3/4" high. Pendant measures 7/16" wide x 1 1/4" high (chain not included). This unique line of jewelry based upon the graphic designs of Dard Hunter is hand-made by our good friend, Todd Hawkinson of St. Paul, Minnesota. Todd has a passion for both jewelry making and influential Arts & Crafts Era designs - and he combines these two passions to create fine jewelry using many of the same methods and tools as those in use 150 years ago! 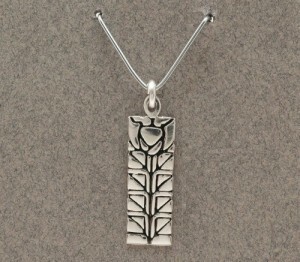 Handcrafted in solid Sterling Silver and always made in the USA. Earring measures 1/4" wide x 1 3/8" high. Pendant measures 1/4" wide x 7/8" high (chain not included). This unique line of jewelry based upon the graphic designs of Dard Hunter is hand-made by our good friend, Todd Hawkinson of St. Paul, Minnesota. Todd has a passion for both jewelry making and influential Arts & Crafts Era designs - and he combines these two passions to create fine jewelry using many of the same methods and tools as those in use 150 years ago! 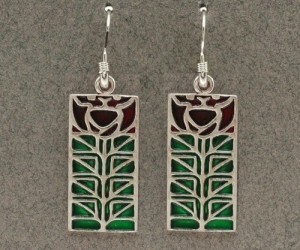 Handcrafted in solid Sterling Silver with enamel, and always made in the USA. 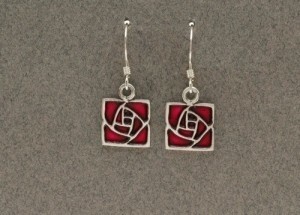 Earring measures 1/2" wide x 1 3/4" high. Pendant measures 1/2" wide x 1 1/4" high (chain not included).